Born on this date: Franklin Ritchie in 1865; Ernest Torrence in 1878; Jeanne Eagels in 1890; Viola Dana in 1897; Zena Keefe in 1898; Peter Lorre in 1904; Virginia Brown Faire in 1904; June Preisser in 1920; Eleanor Parker in 1922. Classic Movie Daily subscribers will find a whole lot of Viola Dana inside today's issue (explained in "Cliff's Notes" below). These titles play on TCM's US schedule (I keep forgetting to update that link! It's right this morning.) and all quoted times are for my own local Eastern time zone. "Summer of Darkness" continues, all day (and night) Friday. —Lady in the Lake (1947) at 11:00 am. I like, don't love, this movie, but that seems to be saying something for me when it comes to film noir, because this is a title I used to actively dislike. The funny part is, I really can't put my finger on why it's grown on me because it suffers from the very elements of "look-at-me" filmmaking that has turned me off to other noir classics over the years. The literary lingo (ooh, alliteration!) and the, 'hey, hey, aren't I different,' mirror gimmick are the too most obvious examples of what I'd usually dislike in this style of movie, yet I like this one a little better every time I see it. The closest I can come to identifying that "it" factor are the performances of Robert Montgomery and Audrey Totter: they're over the top. Unlike the stars of what is currently my favorite whipping boy, Double Indemnity, I don't take Montgomery or Totter too seriously. This movie wants to be as dark and unforgiving as that movie, but it doesn't register that way with me. Perhaps I feel a little like I'm in on the joke here, whereas I'd get the back of my hand smacked for snickering at the other. Hard to explain, but there, I tried. Anyway, good flick! —Out of the Past (1947) at 1:00 pm. Classic of the style/genre/year but, like of much of Jacques Torneur's output, a little too sleepy in pace and mood for me. Hey, I love what he did for the French Revolution in A Tale of Two Cities (1935), but otherwise, not for me. —The Set-Up (1949) at 6:30 pm. One of my favorite film noirs, though I usually regard it a boxing movie. How I wish Robert Ryan and Audrey Totter belonged to the '30s instead of the '40s. —The Stranger (1946) at 11:30 pm. I never even thought of this one as film noir until seeing it on this schedule. Actually, I can see it here, more than the last one, though I'd probably tend more towards calling it an action-melodrama myself. Orson Welles very creepy. Robinson will remind you of the Robinson of Double Indemnity (where he's my favorite part of the movie). Excellent performances. —The Third Man (1949) at 1:15 am. This is an all-time top 10 movie for me (Ask me to list my top 10 sometime, you'll probably get about 35 titles). From director Carol Reed, this one has so much substance that the style never manages to distract. I love the post-War European setting, especially for how it allows so many interesting international actors to be cast in a natural way. Still get goosebumps on Welles' entrance. Thursday night provided a prime example of why I should really complete more important tasks before I go adventuring through the newspaper archives. Following this post subscribers will find a ridiculously long post of photos and clippings that come together to form a biography of Viola Dana, who—despite a couple of early '30s talkies—had really wrapped up her career with the 1920s. She was a major silent star for about fifteen years or so, but I've never seen her in anything. Correction, I've seen her first film, which I never knew she was in, and now I've seen her last television acting appearance, which nobody else seemed to know about until now. Prior to Thursday night, the only time I've actually been conscious of seeing Miss Dana was as a talking head on Kevin Brownlow's still-awesome 1980 Hollywood documentary. The clippings post that follows includes a total of 26 clippings spanning the years 1905-1987, marking Viola Dana's earliest stage appearances to her death at age 90. All of her marriages and one famous romance are covered. There's a screen capture from her first movie, A Christmas Carol (1910) and a few from that TV appearance—she was on a 1963 episode of My Three Sons, for just a minute—that seems to escaped her filmography (at least on the IMDb and Wikipedia). I must say, I never expected that I'd sit down to watch an episode of My Three Sons last night! It's probably been about 25 years since I've last seen one. 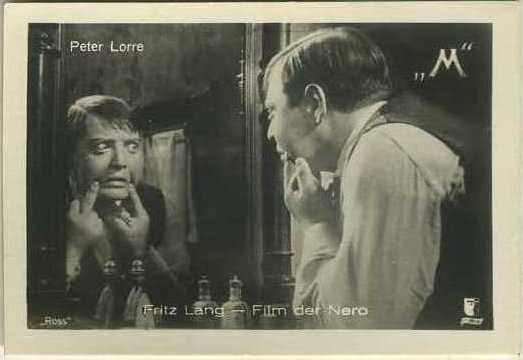 Looking for Peter Lorre images today? Sorry, blame Viola! Due to time constraints (this sends out in just 34 minutes and needs one more edit! ), the clippings post is all I could fit in this morning. I do hope you enjoy it!